schnauzer love, roomba, and layouts. I have been playing with a new camera, so you will always catch me taking random shots here and there. The best practice shots are when Maui and Hilo are up and about. They make excellent practice time. I love the above photo of Maui because that’s an everyday face. She always has to rest her chin up on a pillow, a blanket, or even an arm as support. It’s cuteness overload! On another note, I went Crate Paper happy last week. Even though there’s a vintage feel to it, I thoroughly enjoyed working with the vibrant colors in the Story Teller collection. Additionally, I had fun working with Amy‘s Washi tape too. …and I had fun creating with Pretty Party, as well. As a matter of fact, the shop is hosting a challenge with a $10 gift card reward! If you’re in the mood to step outside of the box, go check it out here. Last but not least, I finally got around to finishing a layout using some of Nikki Sivils‘ latest. Anything with primary colors is a “Yes, please,” in my book. That’s all I have for today. I’m hoping that my creative mojo comes back soon. It seems as if I go through phases where I create like a madwoman, and then the next second, I’ve got nothing. For some reason, this morning I woke up way too early. I looked at my phone and it was only 4 am. Bleh! I have no idea why I got up that early?! All I know is that I couldn’t fall back asleep. Physically, my body was exhausted, but mentally, I had so many ideas running in my head. Thus, I decided to get up, stretch, and create. …and just like before, I mixed old and new. Most of this one is new though. It’s loaded with Crate Paper‘s Paper Heart collection. I love the soft color palette to these papers. Plus, those tile chipboard letters are a major win. Of course, everything changes weekly. The displays, the products, the sample projects — everything changes when I say so, haha. 🙂 Right now, my infatuation lies in trying to find new fixtures to merchandise products and maximize space. *sigh* Lots of work to do before I head down to CHA at the end of this month. mix and match & old and new. As a designer for scrapbook manufacturers, I think sometimes we forget that it’s okay to mix and match various paper lines and embellishments. I think we also forget that it’s okay to use some of your older stash. Seriously, some of that older stuff is just as good, if not better! 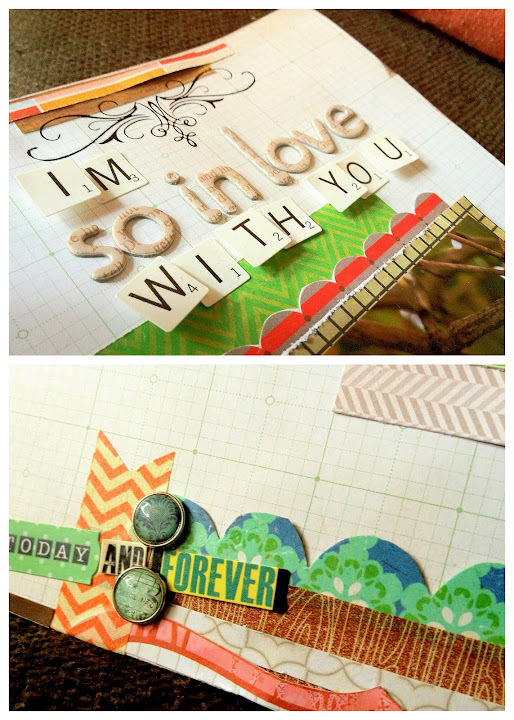 The bottom line is scrapbooking is about getting the photos and documentation into your books. If you can do that, whether or not it’s stylish and trendy or simple and old-fashioned, that’s what matters. With that in mind, I pulled out a stack of my scraps, a pair of scissors, my adhesive, and I got straight to business. I had a lot of fun — there was no agenda, no pressure, no deadlines. It was pure creative bliss. This first layout is loaded with a mix of old and new. What do you think?! There’s no reason why you can’t use older paper for layouts, right?! If you look closely at the “N” flower, I used Christmas paper from Crate Paper. In my opinion, it all still looks great! Today, it’s the first day of rain since around Thanksgiving. Thank goodness! We’ve been really needing some source of water around here. I believe it’s supposed to rain for four to five days, which means it’s time for me to bust out my cute galoshes. I can’t wait to jump around in the puddles with the furkids. playing with paper (and sushi). Today I had a huge urge to be paper crafty. There was no agenda, no assignment to complete. I busted out a box filled with older leftover scraps from previous store projects. It was pure bliss. I wanted to share two of the handful that I made today. First layout was about who I am. I love that the words from one of the many Crate Paper sticker sheets go well with what I was trying to document. Second layout was all about the pups being spoiled. These pictures were taken awhile ago, but I love seeing their “smiles” on their faces, hehe. So cute! With a little touch of Stickles, wah-la! For dinner today, we ate at the sushi bar around the corner. Their sushi rolls are humongous! I’m still full just thinking about it, and dinner was over five hours ago. I took random photos and thought it would be fun to share. Okay, I’m off to bed because I’ve got a long day tomorrow. However, I’m thankful that tomorrow’s Friday! The forecast of my weekend looks fairly entertaining. I’m hoping for the very best.